Red, Black, Blue, Purple, Pink...I'm pretty much fascinated by all colors and shades. And my wardrobe reflects my love for colors. YELLOW??? Not a big fan of yellow unless it's on a happy face. 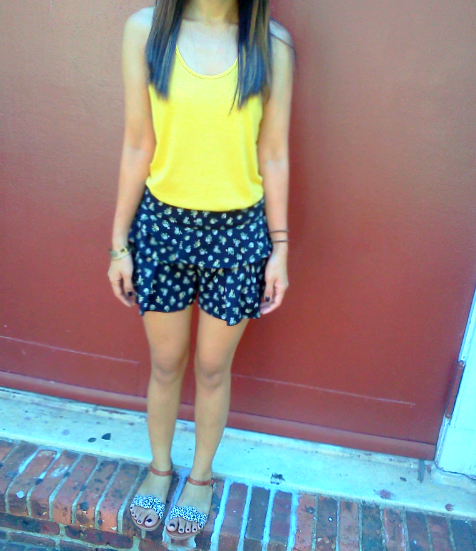 But this yellow Racerback tank compliments my Ruffled shorts so effortlessly. Yellow usually means it's not that serious. Well, my ensemble today is just that - NOT SERIOUS. Here's to hoping YELLOW brings a smile on your face, all sunshiny and bright.